Matt Kalman is a sportswriter and the founder and managing editor of TheBruinsBlog.net. His work has appeared in the Boston Herald, in the Manchester Union-Leader, and on ESPNBoston.com. He lives in Woburn, Massachusetts. The storied Boston Bruins NHL franchise has long been full of pride and passionate fans, and the team has provided decades of incredible memories for its legion of loyal followers. But even the most die-hard fans don't know everything they should about their Bruins. Who holds the team record for 10 penalties? Which player missed the team train to a game, but drove and was still fined? What year did the Bruins switch their colors to black, gold and white? Which Celtics radio broadcaster filled in for a Bruins broadcast? Whether you're a die-hard fan from the days of Phil Esposito or a new supporter of Tuukka Rask, this book contains all the things Bruins fans should actually see and do in their lifetime. 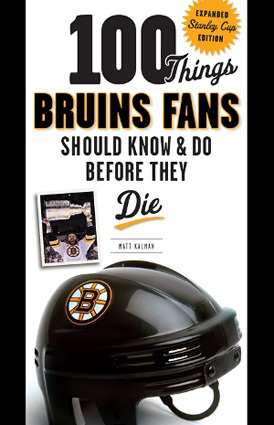 If you bleed black and gold, then 100 Things Bruins Fans Should Know & Do Before They Die is for you. The book features a foreword by former Bruins star Mike Milbury, and offers the chance to be certain you are knowledgeable about the most important facts about the team, the traditions, and what being a Bruins fan is all about. Matt Kalman has been a sportswriter in the Boston area for more than a decade and has covered the Boston Bruins as the founder/managing editor of TheBruinsBlog.net and beat writer for other publications since the heartbreaking lockout year of 2004-05. His work has appeared in the Boston Herald, the Manchester Union-Leader, and on ESPNBoston.com, in addition to other magazines, newspapers, and websites. A native of Staten Island, New York, and a graduate of Boston University, Matt now lives in Woburn, Massachusetts, with his wife, Amy.